Apothecarry Case design is one of a kind Strong, durable, odor resistant, and beautiful. Apothecarry case is handmade of Alderwood, with each individual case carefully crafted and stained one at a time, making every case visually unique. What hasn't changed is the amazing functionality, organization, safety features no other case can provide. Built with style and intelligence a full herb organizational system designed to keep your products fresh, arranged and secure. It's a technologically advanced case that serves to completely redefine the modern smoking experience with goods that are discreet, practical, and offer the luxury and class that the proud modern smoker demands. . . .
No one wants to marvel at the hairs on your buds through a tacky logo or a plastic smelling film case. The Apothecarry case' airtight glass jars allow you to show off your fresh herbs with the oohs and aahs you'd expect from your guests. Fresh wiffs are free and included. While the closed box and jars won't leave your home smelling like the day after a party. . . .
Humidity Benefits: Be concerned. Be very concerned with the plastic storage you are using for your bud. Cheap plastic storage canisters and baggies affect your herbs aroma, taste, and consistency! The Apothecarry case uses a Boveda humidity system to keep the trichomes from drying out. This ensures that you don't run the risk of mold-growth and keep the trichomes sticky enough to preserve the quality, yet dry enough to preserve a nice bun. Regular humidors won't do the trick, as the propylene glycol systems they use often lead to an over-moist moldy product. HANDMADE AND UNIQUE: Each individual case is carefully hand crafted and stained one at a time, making every case visually unique. 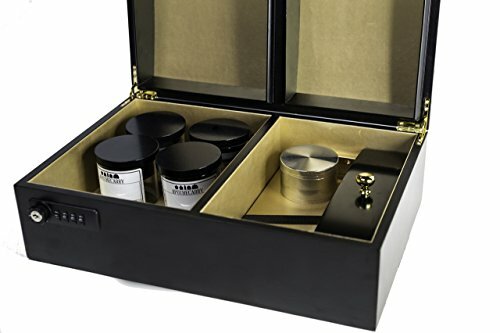 MADE FOR THE CONNOISSEUR: The Apothecarry Case is handmade of Alderwood, outfitted with a security lock and includes all of the essential accessories one would need to fully appreciate the experience of unveiling your collection. STORAGE: With 13 inch x 10 inch x 6.5 inch outer dimensions we have provided you withmore than enough room to properly store your curated collection to enjoy by yourself and share with your friends. If you have any questions about this product by Apothecarry Brands, contact us by completing and submitting the form below. If you are looking for a specif part number, please include it with your message.